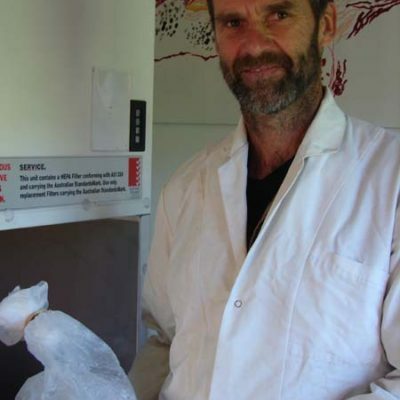 Klaus Lotz of Permadynamics in Matapouri is the first mushroom grower in New Zealand to achieve biodynamic certification with Demeter for two types of mushrooms: Shiitake (lentinula edodes) and Oyster (pleurotus ostreatus) mushrooms. There is one other certified organic mushroom producer in new Zealand, Hillcroft Mushrooms in Napier. 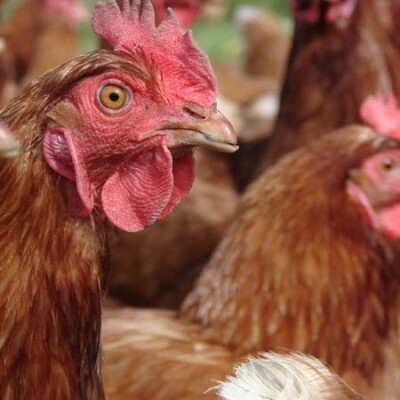 The production process at Permadynamic uses only on-farm resources, feeding any waste back into their permaculture system for use by animals or as fertiliser. Klaus’s production method has been developed over the past twenty years, but his interest in mushrooms got him much earlier. At fifteen he bought an oyster mushroom starter kit and grew his own in a straw bale. Without pasteurisation it only produced one flush, but he had cultivated his first mushrooms. Later, as an agroforestry consultant in Bolivia he used felled logs on which to grow mushrooms. When he and his family moved to New Zealand fourteen years ago, Klaus encountered Warren Sumner who grew Shiitake mushrooms and explained about spawn and where to get it. Spawn is the mushroom equivalent of seedlings (in the plant world), while spores equate to a seed, and like seeds, spores struggle to compete with weeds. Today Klaus cultivates his own spawn on grain in his laboratory. The grain is pasteurised in a large pressure cooker and spores are then mixed into it before being packed into plastic bags until spawn becomes evident. Klaus clones his best quality mushrooms, some of which are still from his earliest strains purchased from a now defunct Hamilton lab. 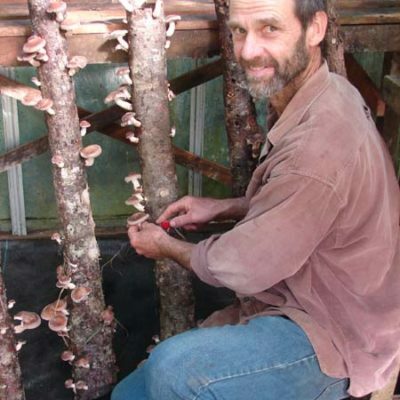 Starting with a hundred suitable logs for Shiitake mushrooms, Klaus also began to experiment with locally available growing substrates for oyster mushrooms. He has it down to a fine art. He begins by accumulating prunings from wind breaks, his forest garden, leftover corn and significant proportions of gorse. Klaus and his wife, Vanessa, keep milking goats, which strip the leaf and bark from the prunings, thus gaining nutrients, and removing leaf which can attract mould. This stage also makes use of green farm waste but the balance needs to be correct, just as in making compost. The stripped woody prunings are chipped and submerged in water heated to 70 degrees for two hours to be pasteurised. Klaus uses an old 400 litre stainless steel milk vat for this process but a bathtub would be just as effective. Once the chips have been pasteurised, the vat is drained and the medium is ready for use. Oyster mushrooms are cultivated by mixing spawn roughly with the growing medium and packing it into recyclable food-grade plastic drums with holes in them. Once the mycelium has achieved maximum development, it seeks an outlet and produces mushrooms through the holes. Klaus doesn’t regulate the temperature but if the growing area is too hot the fungi will dry out, and if too cold, growth is slow. A first showing (flush) should be seen at four weeks. After that, flushes continue at random lessening rates for up to five months. They’re harvested with a small sharp knife. Once mushrooms have gone through the medium, a full cycle is completed by using it for composting toilets and to create a base for the goat stable. Some species such as oak are better for shiitake cultivation, but Klaus uses Alder which does the job admirably. Shiitake logs are soaked for 24 hours and then thumped several times on the ground. 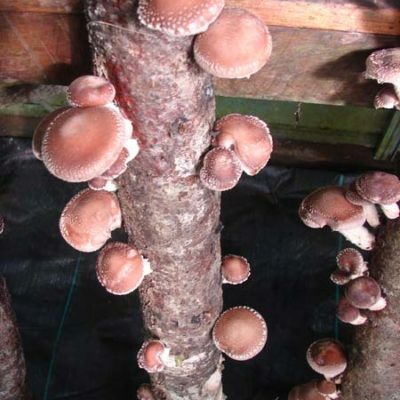 Soaking and thumping produces stress in the logs which encourages the shiitake to produce. After the first flush (approximately two years) the logs are rested under the banana canopy in the bush, and the process is repeated. Some mushroom strains perform better within particular temperature ranges but they can be grown all year round, albeit slower in winter. A feature of mushrooms is that they take heavy metals up from the substrate. Permadynamics’ Organic Mushroom Certification includes regular testing for heavy metals. Tests are processed in a commercial laboratory. Except for heavy metals, fungi are able to break down many unwanted elements including highly toxic chemicals such as dioxins, and can eat up oil spills, and are therefore used in bioremediation to decontaminate polluted soils. Fungi register on the biological scale between plants and animals. They synthesize components contained in animal products but missing in plants. 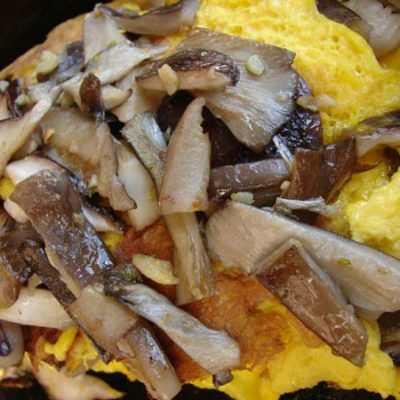 The vegetarian diet lacks certain amino acids so mushrooms represent a good nutrient source for vegetarians. They are an excellent source of Vitamin B complex, as well as a range of antioxidants and other substances that enhance the immune system and reputedly kill cancer cells. Oyster and shiitake mushrooms score high in nutrients while button mushrooms produce very little. Klaus grew burgundy mushrooms (Stropharia rugosoannulata) for a while. They looked good but weren’t so marvellous in the taste department, plus delicate stomachs could be upset. They worked well in the soil however, and to some degree were useful in killing nematodes. Growing on a commercial basis can be costly to set up but for hobby growers a small fruitful fungicultural project is inexpensive. Shelter is optimal, plus bins or cardboard boxes, and sufficient substrate – 200 litres will produce 20kgs of mushrooms. Commercially grown mushrooms virtually always require shelter because fungi make great tucker for slugs, wetas, maggots and myriad insect life, but before growing on a larger scale, Klaus grew mushrooms effectively in a cardboard box under a tree. “Commercial growing really needs clean conditions,” says Klaus, otherwise bacterial disease and moulds can discolour a crop and have it die prematurely. 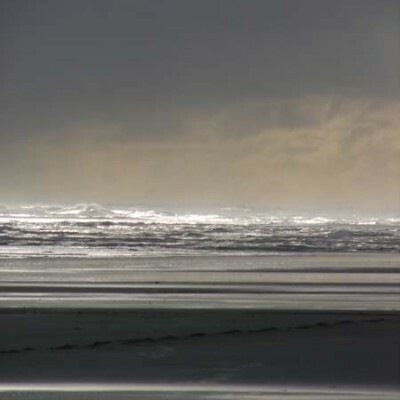 “Hobby scale growing, oddly enough does better in ‘dirtier’ conditions. Initially fungi cultivation looks easy until bugs and disease get in, but with persistence a lot of pleasure and produce can be had”. Commercial growing can become extraordinarily complex depending upon the goal. Klaus sells his produce at the Whangarei Growers Market, to a burgeoning list of food producers, and to restaurants, all of which can wait for a week if growth has been slow. He currently produces around 4kgs per week. Most other commercial growers have difficulty in the sustainability stakes. They require considerable fossil energy for heating, cooling, ventilation, the transportation of growing mediums, and the energy required to fertilise grain and transport the straw for use as mushroom substrate. Once used, the eventual disposal of the plastic mushroom growing sleeves adds to non-sustainability. At Permadynamics very part of the cycle is used to feed another part of the cycle. Vegetation components are grown on-farm, and afterwards go back into the farm cycle where they contribute to the growth of their animals and flourishing forest garden. Klaus rakes embers out from under the pasteurising vat once temperature is reached, and douses them to reap high quality biochar. In this way the small quantity of fossil fuels used to run the chipper compensates for the tiny carbon footprint created to sustain his commercial mushroom enterprise, taking it beyond carbon-zero to carbon-negative. Christopher Hobbs in his book The Medicinal Mushrooms, says mushrooms are among the few non-animal sources of vitamin D.
One cup of oyster mushrooms represents 4% of the recommended daily allowance (RDA) of vitamin D and young mushrooms have the richest nutrients. Generally people synthesise most of the vitamin D they require from sunlight. Oyster mushrooms are a good source of the antioxidant, ergothioneine, which reduces inflammation and prevents plaque build-up in arteries. They are rich in protein and fibre, iron, zinc, potassium, phosphorus, selenium, calcium, folic acid, Vitamins B1, B3, B5, and B12. They also have low calories, no fat, no cholesterol, no gluten, and very low sodium. 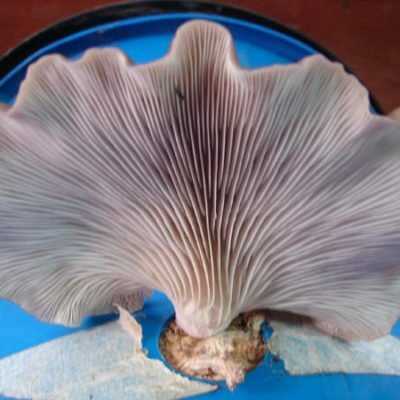 Oyster mushrooms can break down almost anything from coffee grounds to paper, wood and petroleum products. Mycorestoration, a system using mushrooms to lower environmental pollution, is providing revolutionary environmental repair solutions.